Click on pictures above for larger view. 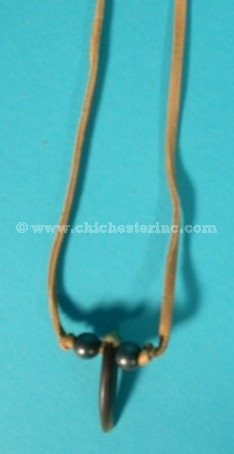 These REAL Badger Claw Necklaces are made using antiqued brass beads and a 32” deerskin neck strap. Badger are not an endangered species. A U.S. Fish & Wildlife export permit is needed for all shipments outside the United States. Not for sale in the following states: Indiana. These necklaces are NOT Native-made. Click HERE for Native-made claw & tooth jewelry. For Real Badger Claws not on necklaces, click HERE.